There’s no shortage of stories out there taking a well-known tale and giving it a modern veneer. Actually, we have a number of books and films resetting classic stories in dystopian or post-apocalyptic settings, so the bar is high if you want to stand out for this brand of retelling. 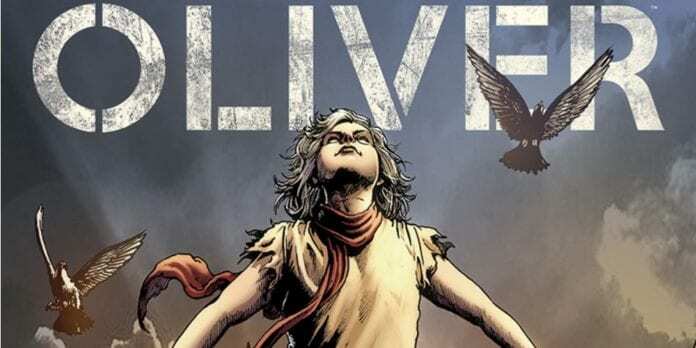 Creators Gary Whitta and Darick Robertson don’t disappoint with Oliver #1, though, transforming a classic into something entirely fresh and engaging. The book retells the Dickens novel Oliver Twist, transplanting the characters from the Victorian era to a post-apocalyptic vision of the future. A colony of men living in the wreckage of a bombed out London find themselves caretakers of a newborn. Naming the child Oliver, they watch as he grows at an accelerated rate. However, the child’s development isn’t the only thing unusual about this gang of survivors. Whitta definitely succeeds in that goal. Oliver #1 does a great job of both establishing the world and the characters that occupy it. In many comics, the desire to create mystery and intrigue ultimately comes across as vagueness or abstraction. Oliver #1 does an amazing job of pacing, though. Whitta seeds mysteries, but gives us enough information to stay firmly grounded in the story. We don’t learn in this first issue exactly how the war panned out or what the outside world looks like. We do, though, uncover the sad circumstances that created Oliver’s surrogate family. The hints provided are enough to not only maintain interest, but heighten it. The story sinks its hooks in and makes you desperate to discover more about this world. Robertson provides wonderfully-detailed artwork in Oliver #1. Every pile of rubble, broken storefront or collapsed column is intricately designed and inked. Thus, despite the grim and dark setting, the level of care applied to the images gives it a beautiful characteristic. The character designs are reminiscent of Robertson’s work on Transmetropolitan. But, while characters in that series had a light sense of vibrancy that concealed a darker tone beneath, these characters provide the opposite. Through expressions and poses, you feel the weight of the situation and just how beaten-down these characters feel. Colorist Diego Rodriguez applies a dark, grimy palette to Oliver #1. This fits the tone of the story, as well as Robertson’s line work. Everything is appropriately gloomy, helping sell the bleak, post-apocalyptic setting. Oliver #1 delivers a great beginning to this inventive retelling of the Dickens classic. The writer provides enough unique story elements to make it feel completely new, backed by outstanding artwork. Please, Mr. Whitta, I want some more.